Rendering of CookNSolo's upcoming K'Far bakery and bar at The Harper, a luxury tower under construction in Rittenhouse. The details on one of Philadelphia's most anticipated restaurant openings did not disappoint on Tuesday. 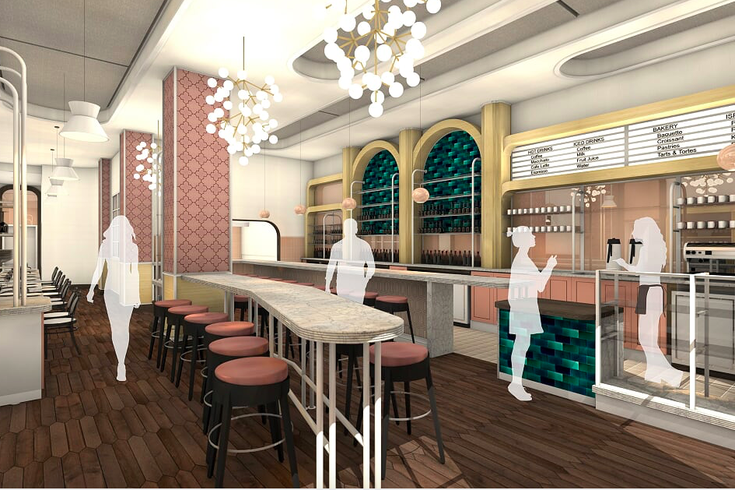 CookNSolo and Pearl Properties revealed plans for a bakery, bar and cafe that will occupy a ground floor space at The Harper, a 25-story mixed-use tower under construction in Rittenhouse. The new Michael Solomonov concept, named K'Far, translates in Hebrew to "village," referencing the central role of the bakery in Israeli life. Solomonov's first kitchen job was at a bakery in the town of K'Far Saba, just north of Tel Aviv. “When we learned about The Harper, we knew it would be the perfect home for K’Far,” said Solomonov's partner, Steven Cook. “Pearl’s track record of creating community in Philadelphia is unparalleled and The Harper proves the point in the heart of Center City." The ultra-luxury tower at 110 S. 19th Street will include retail and office space along with a state-of-the-art fitness center, basketball court, outdoor pool and other amenities. Residents will have lobby access to K'Far. "We want K’Far to be the village bakery – a place where people of all stripes can gather over a cup of coffee and a boreka in the morning, or a glass of wine and a hearth-cooked meal in the evening," Cook said. Pastry chef Camille Cogswell, who won a James Beard Award last year for her role at Zahav, will be at the helm for K'Far. The Harper, named after Rittenhouse Square's first builder, 19th century U.S. Congressman James Harper, is expected to open to its first residents in June.